The indispensability of tree pruners is without question. If you have trees, shrubs, and vines dotting your yard, at some point you’re going to have to deal with low hanging twigs and limbs and overgrown branches. Aside from making the yard look unpresentable, overgrown and low hanging branches also limit movement and can break and fall on you, harming you or the young ones. And unless you want to be borrowing from your neighbour now and then, or incur additional expenses by seeking the services of a professional, you need to invest in a practical and functional tree pruner. Tree pruners give you better access to hard-to-reach branches and limbs without having to use any tipsy ladders; the feet will be firmly planted on the ground the entire for that extra stability. And unlike conventional chainsaws, tree pruners have the advantages of being lightweight, easy to use, versatile, safe, and cost-effective. Purchasing a tree pruner is an easy exercise. Simply walk into a store and pick the next one on the shelf, or better still, order one online. What is difficult, however, is choosing one that best suits your unique requirements and circumstances. In light of this difficulty, we’ve taken it upon ourselves to put together a comprehensive list of the best tree pruners on the market currently. The featured models have been tried and tested time and again and each time, they’ve held up pretty impressively, no matter the challenge. The factors to take into consideration when buying a functional and practical tree pruner are explained in the next section. The Sun Joe brand is a highly reputed firm that has time and again proved its worth when it comes to manufacturing simple, easy-to-use, all-around power tools. The Sun Joe SWJ802E with Adjustable Head is no exception, seeing as it follows closely in the footsteps of its high-quality counterparts. The product is both safe and easy to use considering that it's lightweight and compact and therefore won't expose you or your family members to any risks or bodily harm. Whether you're planning on doing some close pruning or reach the furthest branches, the Sun Joe SWJ802E is the right tool for you. Handling and using it is a straightforward and easy endeavour, thanks to the already mentioned small and lightweight profile. Unlike ladders that are unstable and quite risky to use, the tree pruner allows you to effortlessly and conveniently reach overhead branches and limbs 15 feet overhead with your two feet firmly planted on the ground. Such effortless and quick reach to hard-to-reach branches and limbs is possible because it is equipped with a height adjustable and telescoping pole. It is therefore easy to control and manoeuver even when it is extended to its maximum height of 15-feet. The Sun Joe SWJ802E draws its impressive cutting speeds from a high-performance 6.5-Amp motor. 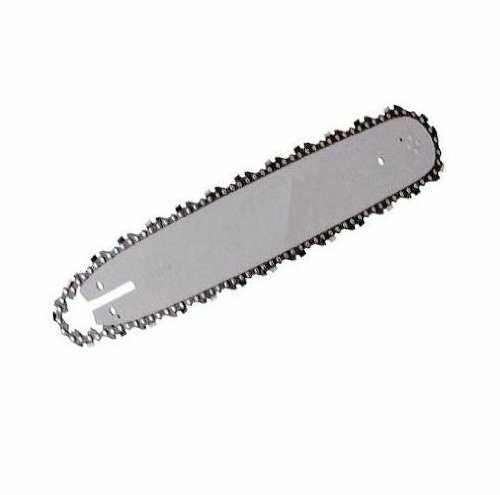 With such an abundance of power, the blade powers easily and quickly through branches and limbs of up to 7.5-inches in thickness, irrespective of how stubborn or abrasive they are. The implication here is that compared to another person using a conventional pruner, you'll be finishing your projects way ahead of them. The tree pruner also has an 8-inch bar and chain that are kept sufficiently lubricated during operation with the assistance of the auto-oiler. No point manually pumping the oil from the oil reservoir to keep the two lubricated, as is the case with off-brand models. 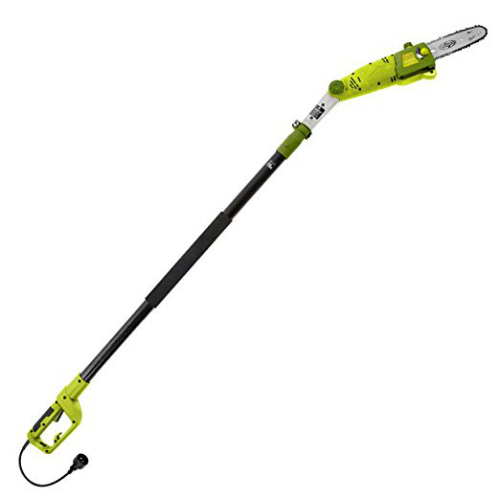 An additional unique selling point of the Sun Joe SWJ802E 9 FT 6.5-Amp Electric Pole Chain Saw with Adjustable Head is its multi-angle adjustable head. Because of the feature, you’ll have the easiest time cutting branches and limbs from any angle falling within the 0-degree to 30-degrees spectrum. With such versatility, no part of the tree, shrub, or vine is hard to reach. It's hard to deny that the Sun Joe SWJ802E comes with several impressive features; the kinds that bring the pesky, out-of-reach branches and limbs within easy reach and without the use of any rickety ladders. The unit takes the danger and difficulty out of trimming lowly-hanging branches and logs so that your yard remains neat and presentable. Couple the telescoping pole capable of extending an impressive 15-fee in the air and its multi-angle head, and you have a tool that can easily cut at angles between 0 and 30 degrees without your feet having to leave the ground. These features, and so many more are indicative of the superior performance of this tree pruner, and if that's what you want in a tree pruner, you have your chance to own one. The Worx WG309 is a cost-effective and flexible tool that's perfect for light-duty to medium-duty pruning and cutting of tree branches. The tree pruner has several impressive features under its belt, from powerful performance, incredible ease of use to versatility. Because of the placement of the motor at the top, though, you may have a few minor issues with controllability and manoeuvrability as a result of the uneven distribution of weight. Apart from that, the WORX WG309 works like a charm and comes with an automatic oiler and chain tensioning, both of which considerably increase convenience and user-friendliness. Enough with the overview, now let's dive into the technical details that make the tree pruner a solid choice. The WORX WG309 comes with the typical benefits and downsides you’d expect of any electrical tool. On one side, using the machine is quite a breeze seeing as it comes with a push-button to allow for a quick start and the need for very little maintenance. Additionally, the tree pruner is cost-effective and boasts a longer run time, and you won't create any messes while mixing dealing with fuel and oil. On the other hand, the presence of long power cord considerably limits your mobility as it gets tangled with branches. Controlling and manoeuvring also requires some upper body strength particularly when it's fully stretched out because most of the weight is concentrated at the top. The versatility of the WORX WG309 is yet one of its several keynote features. For instance, the design allows you to completely detach the chainsaw without the use of any specialized tools. Consequently, you don’t need to purchase a separate chainsaw for slicing up the cut limbs and branches into smaller pieces. 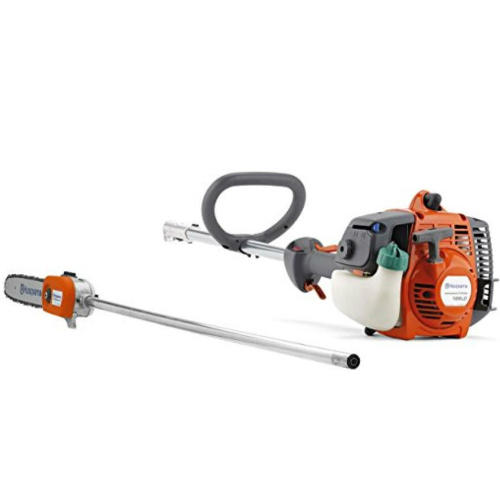 If you’re on the market searching for an all-around tree pruner that’s both lightweight and powerful for pruning or trimming the overgrown branches or limbs in your backyard, look no further than the Husqvarna 128LDX 10-Inch Detachable Pole Saw. It has a moderately powerful 25cc, 2-cycle engine capable of effortlessly supplying you with adequate power for pruning through the densest trees with a lot of ease. This is despite the fact that it’s reasonably and fairly priced and quite easy to use, too. And when you’ve done enough pruning for one day, you can easily store it in the garage without it taking up too much storage space, thanks to its detachable shaft. Read on to find out more about this capable tree pruner. As is characteristic of any other power tool, the Husqvarna 128LDX also has its fair share of downsides and advantages. To begin with the good news first, the machine obviously has a powerful engine, like all other gas-powered tree pruners on the market. Secondly, the lack of a power cable means it won't be getting tangled with other items and objects in your path, which in turn translates to superior mobility compared to electricity-powered models. The downside though, is that you'll have to deal with the messy process of mixing gasoline and oil, carry out regular maintenance because of the unit's relatively short maintenance circle, and to have to contend with loud noises, not to mention the considerable weight of 11 pounds. Assembling the Husqvarna 128LDX is very easy, and you have at your immediate disposal clear and easy-to-follow instructions on how to proceed. The tree pruner gives you a reach of just 8 feet plus the weight won't allow for extensive overhead use. While the tree pruner is easy to use, requiring no experience whatsoever, it still has the problem of excessive weight. It's a little taxing having to use it continuously trying to prune or cut down hard-to-reach branches and limbs on tall trees. Previous and current users concur that the machine packs plenty of power for its size, allowing it to accomplish its duty precisely, quickly and effortlessly. Its performance is however understandably not comparable to that of heavy-duty tree pruners. It powers easily through branches and limbs with a thickness of 6-inches but struggles to go through anything thicker than 8-inches. Word of advice, refrain from pushing it against the branches as doing so could lead to bogging down. Rather, let gravity and its weight work to your advantage, and you'll end up using little effort and time. Even though it lacks a push-button for quickly starting the engine, you’ll get it roaring to life in just about two pulls. Like the previous product, it also has an automatic oiler that ensures smooth and optimal operation. For versatility, the tree pruner happens to be compatible with a wide selection of attachments. 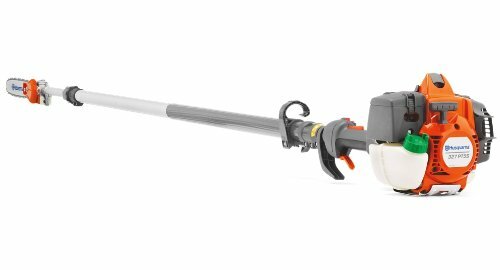 As a result, you can also use it as a blower, hedge trimmer, or even a cultivator, even though the design limits you to only Husqvarna parts. Despite being a pricey model, the Husqvarna 128LDX offers you several premium features that justify the pricing. Impressive features such as top-end performance, ease of use, compatibility with a wide array of attachments, and incredible versatility surely don’t come cheap. If you’re a homeowner, enthusiastic Do-It-Yourselfer, or professional pruner looking for nothing less than the absolute best, look no further than this option. It starts easy, operates quietly, and is perfect for a large yard with several trees. If the thought of using a tipsy and rickety ladder to trim and prune your backyard trees, vines, and shrubs in sending chills down your spine, it's time to invest in a safe, convenient and time-saving alternative. And one of the best tree pruners out there that in addition to letting you do the pruning safely with your feet planted firmly on the ground is also budget-friendly and guarantees you an impressive 9-1/2 feet reach is the Earthwise CVPS41008. You also have the option of detaching its 8-inch chainsaw by simply pressing a button, in which case it doubles as a chainsaw, allowing you to quickly cut the fallen limbs and branches into even smaller pieces. The Earthwise CVPS41008 is equipped with an averagely powerful 6.5-Amps motor, which makes it an ideal tool for light-duty to medium-duty pruning activities in an averagely sized yard. Couple the power and the 8-inch bar and cutting down branches of up to 6-inches in diameter should present much of a challenge. While you can still subject it to occasional heavy-use, you’re going to need to make several cuts before succeeding. The cutting speed doesn't compare to that of top-of-the-line tree pruners, but for normal, everyday use around the house, it is more than sufficient, and will effectively take the time and effort away from cutting up branches and limbs. Closely related to performance is the ease of use. Overhead tasks like pruning branches and limbs is a taxing project and will inevitably strain several parts of the body, most notably the hands, back, and neck. No one wants to risk straining their neck, suffering hand fatigue or throwing their back out just to keep their yard neat and presentable. Being a Do-It-Yourself task, manufacturers strive to make their tree pruners as easy to use as possible. In the case of the Earthwise CVPS41008, the weight comes in at just 10 pounds. Consequently, controlling and manoeuvring the tree pruner will be a breeze even for the elderly. Couple the lightweight characteristic with the telescopic shaft and you have a tool that brings branches and limbs in hard-to-reach spots within an arm's reach. Extending and collapsing the length of the tree pruner is made easy with the inclusion of an easy-to-reach lock that you can easily twist to adjust the length in accordance with the demands of the project. You can also quickly and easily convert it to a standalone chainsaw by detaching the saw, and because of the simplicity of its construction, you don't even have to refer to the user manual. As a standalone saw, you'll be able to cut the fallen limbs and branches into finer pieces suitable for use as firewood. And with an automatic oiler, servicing a tree pruner to ensure it maintains its optimal performance all year long has never been easier. The automatic oiler only demands that you fill the reservoir with oil before and during operation so that both the chain and the bar are sufficiently oiled. Aside from that, you need to occasionally check the chain to ensure it's not badly damaged before you begin trimming, cutting, or pruning. Such minimal maintenance requirement partly explains why it is one of the tree pruner preferred by the mainstream of homeowners, Do-It-Yourselfers, and professional pruners. Overall, the Earthwise CVPS41008 offers the user several benefits. Coupling the unit's 9-1/2-feet reach with your own height should give you an impressive 15-feet reach off the ground. Another strong suit it comes with is competitive pricing: you don't have to break the bank to own one of these. The tree pruner has a sufficiently long 24-month warranty to cater for repair and replacement of defects parts. Most importantly, it is easy to use, packs incredible cutting power and is versatile. We'd definitely recommend it to you. Judging by physical appearances, the GreenWorks 20192 does not have any particularly distinct features to distinguish it from the other tree prunes on the market. Essentially, it's one of those machines you stumble upon on your search for the best tree pruner, and this list would still be complete without it. Which would make it easy to describe using the same mundane words and phrases used for ordinary tree pruners. That's until you take a closer at it, at which point you realize it packs pretty decent features to take for granted. To start off, it has a high-performance 6.5-amp motor capable of generating plenty of cutting power. Its performance figures indicate that it would stack up pretty nicely against the pricier and higher placed tree pruners on this list. 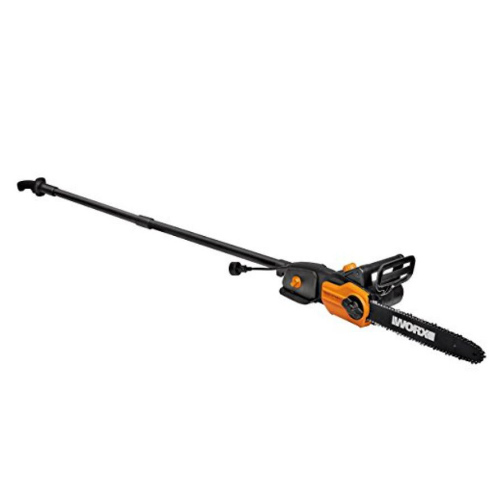 The machine features a sufficiently long 8-inch bar and chain boasting an incredible capacity for cutting some considerably thick and dense overhead branches and limbs. And because it has an automatic oiler, using the tree pruner should be incredibly easy, voting off the need for constantly checking the oil level without risking the possibility of the machine freezing up on you in the middle of an operation. Another similarity it has with other tree pruners in its class is the presence of quick-to-adjust chain tensioning system that invariably guarantees that your chain is tight. A tight chain is necessary for a swift and clean cut on some of the toughest limbs and branches without putting in too much effort. Another unique selling point is the inclusion of a translucent oil tank to allow you keep a close eye on the amount of oil remaining on the tree pruner. Extending and collapsing the shaft is an easy and straightforward endeavour. Extending it fully gives you a reach of 8 feet, which, coupled with your own height allows you to reach quite some distance. While the length is not quite as extensive as that of pricier models, it still allows you some reasonable reach to the hard-to-reach limbs and branches. The lightweight and compact physical characteristics makes it a prudent choice for users who lack any considerable upper body strength. With a mere weight of just 10.5 pounds, all adult family members should have an easy time using it to prune and cut overhead branches and limbs for a prolonged period without experiencing any overwhelming hand fatigue or strain on the neck, back or arms. 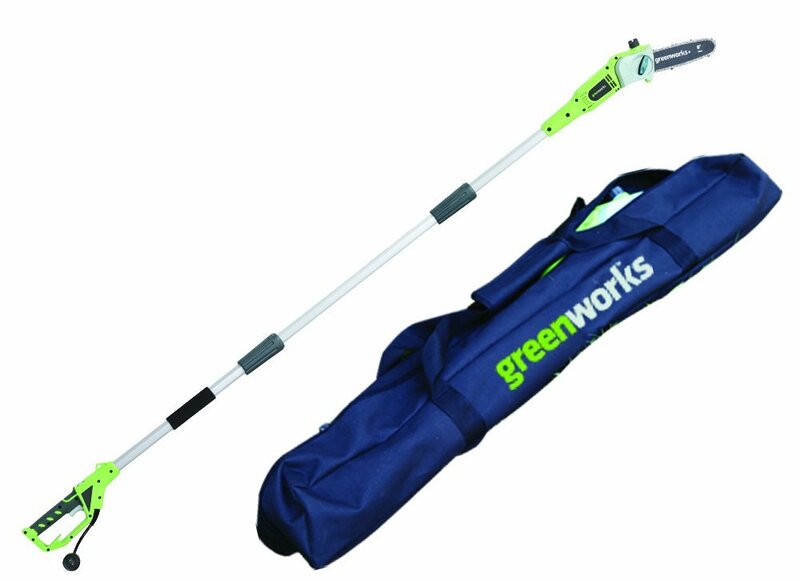 Aside from its short length, another glaring downside of the GreenWorks 20192 is the fact that its construction quality does not qualify it for heavy-duty use around the house, or anywhere else for that matter. A few users also say that the oil system is prone to occasional leaking, but nothing so serious as to discourage a purchase. Those who need a practical and functional tree pruner for regularly pruning trees, shrubs, and vines on the backyard will find it to be quite a solid choice. 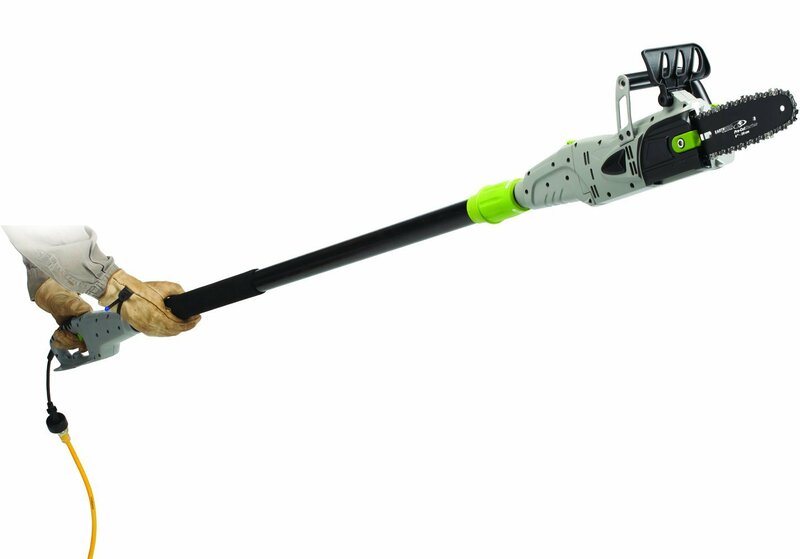 The GreenWorks 20192 is an exceptional tree pruner as any other on unit featured on this list. It has several unique selling points, the most outstanding being its pocket-friendliness, high-performance, convenience, and relatively long reach. You get a generously long 48-month warranty with each purchase to cover you against any defects resulting from the manufacturer’s use of poor-quality materials or poor workmanship. For those keen on taking their trimming to a whole new level, the versatile, lightweight, and powerful GreenWorks 20192 is waiting for you. As far as simplicity and usability are concerned, the Earthwise CPS40108 happens to be the undisputed king of the playground. The learning curve is gentle enough that even the elderly, lacking both in upper body strength and technological inclination, will be using it expertly after a few minutes of familiarizing themselves with it. While it might lack the advantages of a gas-powered model, it effectively handles all trimming, cutting, and pruning jobs thrown its way in a fraction of the time it would take conventional methods. Despite its off-the-charts versatility and bucket-list of features, it remains surprisingly affordable. These, and several other impressive features it offers the user, makes it one of the best tree pruners to consider for purchase. Unlike rickety ladders, it has a long shaft capable of reaching some9-feet up with both your feet planted firmly and safely on the ground. The extensive reach allows you a quick, unhindered access to hanging twigs, limbs and branches there were previously in hard-to-reach spots. Doing close-up pruning is also possible, thanks to the adjustable and collapsible design of the Earthwise CPS40108. A unique feature is the presence of a 360-degree swivelling auxiliary handle that effectively makes short work of keeping you're the trees, vines, and yards on your yard neat and presentable. The fact that the elderly members of the society can use it without breaking a sweet is a testament to its user-friendly design. The tree pruner is both lightweight and compact to keep you from experiencing neck strain, and arm and shoulder fatigue. Such ease of use translates to longer working hours and greater productivity. Also, the tree pruner is constructed entirely using fiberglass material that is renowned for being lightweight yet rugged and long-lasting. The unit is as a result capable of withstanding daily, heavy-use in different environments. The icing on the cake is the inclusion of an anti-slip grip that minimizes inadvertent slippage when the user is trying to reach far-placed twigs and limbs on a rainy day or when the hands are excessively sweating. The Earthwise CPS40108 is equipped with a standard 8-inch bar and chain. Even though such a length is not the most ideal for taking on major pruning, trimming or cutting projects around the house, it nonetheless gets the job done quickly and effectively if the branches and limbs are not too thick. Like most other products, the tree pruner features an automatically adjusting tensioning system that guarantees the consistency of performance all through the pruning and trimming project. And to top it off, there is an auto-oiler feature for keeping the bar and chain sufficiently lubricated. Being a battery-powered machine, it uses a moderately powerful 18-Volt/17 AH NiCad battery. When you juice runs out, you won’t have to wait too long for it to recharge. The lack of power cords means you get to enjoy unrestricted mobility and portability: provide you have a spare battery, you can confidently go far away from a power outlet. With the Earthwise CPS40108, you have all the features you need to give the trees in your yard that long overdue trimming, pruning, and cutting. Whether it is exceptional power, superior dependability, effectiveness, or consistent cuts, the tree pruner has it all. This is beside versatility, functionality, and ease of use. The icing on the cake is the affordability: you have to dig any deeper into your pockets. The only notable downsides are the short battery life and the ambiguity of the instructions on the user manual. Aside from these, it works like a charm, delivering consistent power for quickly and effortlessly bringing down those overgrown twigs, limbs, and branches. Homeowners and enthusiastic Do-It-Yourselfers with a backyard dotted with several trees with thick and tough branches need a robust tree pruner best suited for the job. And here is where the Silky Telescoping Pole Saw Hayate 420 enters the scene. 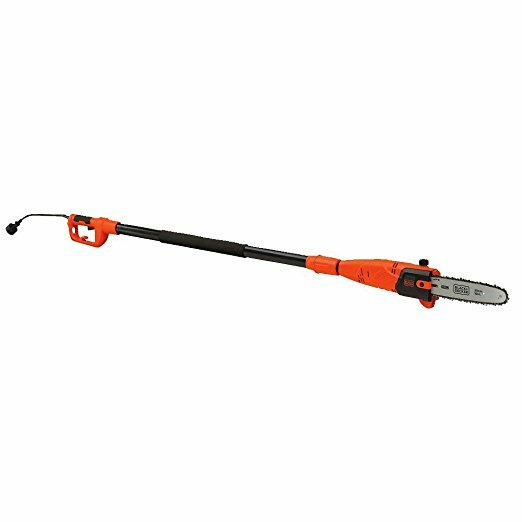 The unit features heavy-duty construction and has a telescopic shaft that together qualifies it for the tough project of trimming, pruning or cutting down overgrown limbs and branches. Plus, it has contemporary looks that will appeal immensely to aesthetically-inclined individuals. Despite being a pricier choice, it has the advantages of giving the user an exceptionally long reach, perfect weight distribution, and of course, great performance. Read on to find out why the premium price shouldn’t deter you from rewarding yourself with the Silky Telescoping pruner. 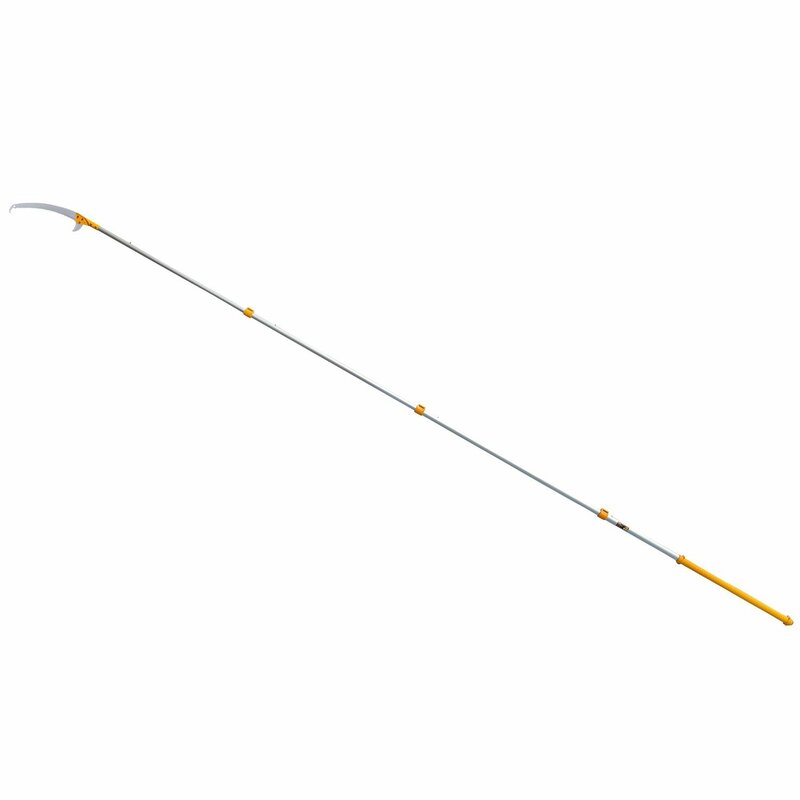 Unlike most other off-brand tree pruners, controlling and manoeuvring the pruner toward a specific direction or into tight spots up on the trees is much easier, thanks to the oval shaping of extension poles. Meaning that going forward, no branches or limbs will be truly out of reach. The fact that the extension pole features an all-thick aluminium construction reduces the possibility of the pole bending, no matter the extent of abuse it's subjected to. The sturdy and rugged construction gives you the freedom of using it for pruning each and every type of tree, shrub, and vine in your backyard, no matter the thickness of the branches and limbs. It is also one of a handful of tree pruners constructed with the safety of the user in mind. The grip, for instance, is oversized and rubberized to increase comfort for those who’ll be using the unit for several hours on end. The rubberized overgrip, other than stopping the growth of blisters, also ensures you have a firm and secure grip, so the tree pruner does not slip out of your hand in the middle of a project. Therefore, you can continue trimming, pruning and trimming even when the hands are covered in sweat or in the heaviest downpour. And, on the off chance that it does slip off your hands, and the base is fitted with a shock absorber for reducing the consequences of the impact. Its curved blade is fitted with very precise teeth which, coupled with the fact that they are capable of cutting at four different angles, translates into a quick and effortless cutting. The impressive cutting speed is on top of the incorporation of a high-performance motor that effectively makes light work of cutting down thick and overgrown branches and limbs. Its lightweight and compact profile goes a long way in increasing ease of use and convenience. At just 7.9 pounds and a taper-ground profile, there is minimal drag, and most of the usable energy is directed towards the cutting edge. As a result, it would be prudent of any user to leverage the weight of the tree pruner and gravity to get a cleaner, quicker cut without applying too much force themselves. Everything considered, it is a perfect choice for users in need of a high-quality tree pruner with an extensive reach and durable construction. It's a model that's optimized for heavy-duty use around the house and other settings. The weight distribution is perfect; it accords you a maximum reach of 20 feet, and has a telescoping system with double locking system. With its powerful motor and fast-cutting speeds, limbs and branches less than 5-inches in thickness can't present a real challenge. It is a tree pruner for people who want nothing but the best. The Black & Decker PP610 is what the professionals would call a true workhorse. The tree pruner reeks of high-quality construction and has a commanding presence in the hand, the kind that facilitates ease of use, manoeuvrability, and controllability. It is constructed using industrial-grade materials that ensure it is sufficiently rugged and robust to take on extreme abuse without any performance issues. The pruner will prove its worth when you have tree branches and limbs brought down by heavy snow, wind or ice storms. Apart from the top-notch construction, the tree pruner also happens to be lightweight, easy to use, and powerful and brings the furthest branches and limbs to within an arm’s reach. The only major drawback of the tree pruner though is the inability of the saw to detach from the pole. Now, let’s dive into the juicy details. 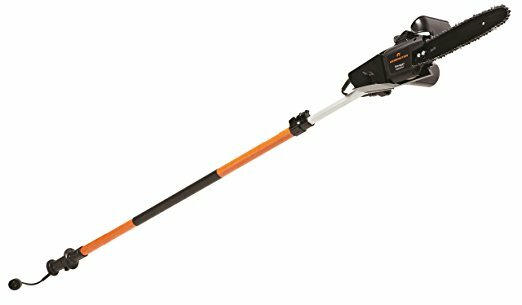 The BLACK+DECKER PP610 features a high-performance 6.5-amp motor, which essentially means that it is one of the most powerful tree pruners out there. The powerful motor generates incredible cutting speeds for cutting quickly and effortlessly through tough limbs, logs, and branches. Coupled with the long 10-inch saw bar, cutting down branches of up to 6-inches should be child’s play, taking up the least effort and time. Being an electrical model though, your reach is considerably limited. You don’t have the freedom of venturing too far away from a power outlet and while at it, you’re going to have to deal with the power cord getting tangled frequently on branches, stems, and other objects in your path. Plus, it doesn’t produce any uncomfortably loud noises like other off-brand tree pruners. As already mentioned, it features one of the toughest construction qualities in the industry. The use of commercial-grade plastic and metal means the machine is capable of withstanding extreme use occasioned by lots of wear and tear. Provided you use it gently, carry out occasional maintenance when vital parts begin to ship out, it should provide you with more than a lifetime of reliable and faithful service. Like most other tree pruners, it comes with an adjustable shaft that you can easily extend and collapse to between 6.5-inches and 9.5-inches. With such a length, the tree pruner has no difficulties accommodating branches and limbs placed high up on the trees, and without the need for a ladder. With a weight of only 8 pounds, all family members, starting from the teenager to the elderly grandmother in the house. The best part about being lightweight and compact is that the chances of straining your neck or hands or throwing your back out are non-existent. For a tree pruner in its price range, the BLACK+DECKER PP610 provides the user with lots of value with regard to general construction and design. On the subject of ease of use, it stacks up pretty well against its pricier counterparts on the market. The unit, for instance, is fitted with a tightening mechanism that you simply twist to adjust it to a height of your choice. No need investing in any additional specially designed tools for changing the height, and the process is quite simple and straightforward. Plus, the handle is ergonomically designed with very impressive anti-slip properties. There’ll be no hassle starting the tree pruner as it’s equipped with an auto start that you simply press down to get the motor up and running. Neither will you have difficulties trimming tough branches and limbs considering that there is very minimal kickback. Everything considered, it’s safe to say the BLACK+DECKER PP610 is incredibly easy to use by people of all ages. For professionals, homeowners, and DIYers in need of a high-quality, pocket-friendly, and long-lasting tree pruner for trimming down their overgrown backyard trees, this option is more than a perfect choice. Its appealing features include being lightweight and therefore easy to use, and of course powerful performance. You'll, however, have to contend with the lack of an automatic oiler, limited reach and the inability to operate as a standalone chainsaw. It will undoubtedly give you value for money. The second gas-powered tree pruner to feature on the list of ten of the best tree pruners to check out in 2018 is the Husqvarna 327PT5S. It has all the characteristics, features, advantages and disadvantages typical of all gas-powered models on the market. Even then, it also packs several distinctive features that set it apart from other units on the market. 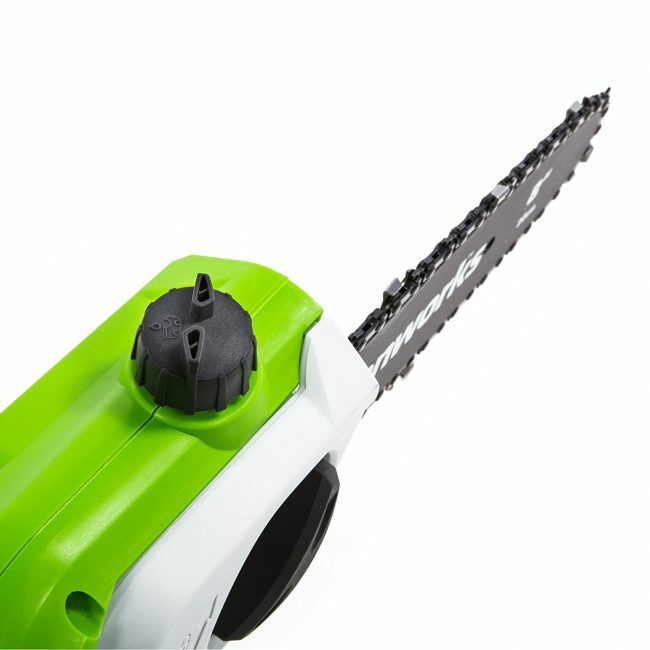 It has an impressively long reach, works powerfully and quietly, it starts easily without any issues, and is one of the most flexible solutions for trimming, pruning and cutting down overgrown and low-hanging branches and limbs. Additionally, it features heavy-duty construction which means it wears and tears much slower than your average tree pruner. With proper care and maintenance, it should easily provide you with reliable and faithful service for more than a lifetime. Now, let’s get to the technical stuff. The Husqvarna 327PT5S is powered by a 2-stroke, 24cc, and 1.2-HP engine. Even novices understand such figures means exceptional power output that translates to high cutting speeds. Aside from an abundance of torque, the tree pruner also features an extended 12-inch bar for cutting effortlessly and quickly through the thickest and most stubborn limbs and branches that cross its path. Starting it takes no effort at all. At most, the engine will start on the second pull even when the temperatures have dropped. The Husqvarna brand puts considerable thought into making their products as easy to use as is humanly possible, as is evidenced by the simplistic design. There is a convenient automatic oiler that you can customize to allow only a specified amount of oil to reach the chain and bar. The feature prevents the possibility of over-lubricating the tree pruner. The smooth and efficient working of the air purge system means starting the tree pruner will require a maximum of two attempts at pulling the cord, which is more convenient than the vast majority of gas-powered tree pruners out there. The fact that the unit has a telescopic pole makes it a versatile choice for pruning branches and limbs located some 16-feet from the ground. Even at 16.1 pounds in weight, using it with the pole fully extended is not much of a problem. The unit is properly balanced and has a harness that bears a large percentage of the weight. Consequently, you won't suffer from hand fatigue or neck strain or develop blisters all over your hands from using the tree pruner for long hours on end. Another major strength of the unit is that it requires very minimal maintenance. All you have to do is frequently inspect the status of the chain to make sure it's not too damaged and that the spark plug and air filter are in their best performance condition. Also, make a point of religiously filling the auto oiler reservoir. In case there're any defects, let the two-year warranty take care of them. The Husqvarna 327PT5S comes with a premium price tag, which might immediately shift your attention to the several cheaper models on the market. However, if you need a tree pruner capable of withstanding heavy use on a daily basis without giving up on you, it would be prudent to go for this one. The machine features top-notch construction quality, powerful performance, and starts in a heartbeat. If these are qualities you care for, the premium price should be more of a motivation to get it right away. Maintaining your yard inevitably involves pruning, cutting down and pruning those overgrown and low hanging branches and limbs. Unfortunately, using conventional means of gaining access to the overhead branches, such as a ladder, exposes you and your loved ones to great danger. You could easily fall from a wobbly and unstable ladder onto a sharp and pointed object or break your hip on impact. To ensure your safety, consider using a more modern, convenient, and time and labour-saving alternative such as the Remington RM1025P. The Remington RM1025P is a multipurpose tool that guarantees you unrestricted access to branches and limbs in tight spots, thanks to its 10-feet telescopic shaft. Apart from professionals, a large percentage of homeowners and enthusiastic Do-It-Yourself consider it their go-to tool for trimming overgrown trees, shrubs, and vines. The tree pruner comes highly recommended for several reasons that include exceptional functionality, versatility, and efficiency, not to mention the fact that it is lightweight and therefore easy to manoeuver. Like its newer brother, it uses the pinnacle of cutting-edge technology to provide you with the absolute best service. 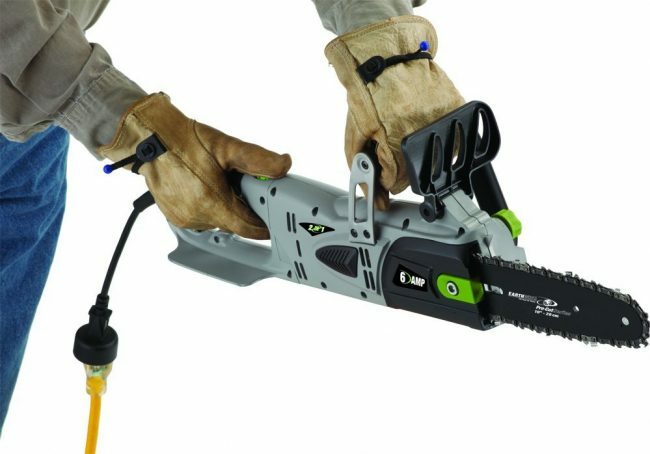 It comes with a high-performance 8-amp motor that reliably supplies it with plenty of power for effortlessly and quickly handling light-duty to heavy-duty pruning projects. Any branch or limb less than 9-inches in thickness doesn’t present much of a challenge to the formidable power of the pruner. The key to efficiently, effortlessly and quickly pruning branches and limbs is to let the weight of the unit and gravity do the heavy lifting. Additionally, the unit gives you an impressive reach of up to 15-feet from the ground and without having to use any risky ladders. As is the case with most professionally built tree pruners, using it is quite a walk in the park. The chain and bar have low kickback that significantly minimizes the likelihood of suffering hand fatigue and harm that are typically experienced when using tree pruners. The inclusion of ergonomically designed handle ensures a secure and firm grip to accord the user superior control while minimizing the possibility of slippage. Also, there is a thoughtfully included anti-rotation feature for keeping it in the area you intend to make a cutting. On a negative though, the tree pruner doesn’t have an automatic oiler feature, meaning that you’ll be manually pumping the bulb on the oil reservoir cap from time to time to ensure the proper lubrication of the bar and chain for optimal performance. The design and construction are at par with its performance. It’s the kind of balance you just don’t get with other tree pruners. Switching from the pole to a standalone chainsaw, for instance, only requires that you detach and then adjust the aluminium pole: a simple and straightforward lasting less than five minutes. The locking trigger guarantees that the pole remains extended or collapsed as required, which ensures ease of use and convenience. To conclude, we'll try to give you a quick recap of the unique selling features of the Remington RM1025P to give you several solids reasons to consider going with this option. For one, it features a robust and rugged bar and chain to make light work of trimming limbs and branches. Cutting down the thickest branches we'll be comparable to cutting a piece of cake with a hot knife, thanks to the powerful 8-amp motor. Using the tree pruner is easy as it comes with easy to use flip and lock clamps for either adjusting or collapsing the pole to a desirable length, which has a maximum reach of 15 feet. Lastly, there is an ergonomically designed non-slip grip that increases controllability and manoeuvrability while minimizing slippage and accidents while working. Together, all these features make the Remington RM1025P valuable choice for any professional, DIY, and even homeowners. Like all power tools, tree pruners can cause life-threating harm to the user if they aren’t correctly handled. By their very nature, tree pruners are essentially chainsaws on an elongated pole that you use to prune overhead branches and leaves. The chances are high that if you don’t use them carefully, they or the branch you just cut can easily fall on your head. To be safe, look for a unit with as many safety features as possible. Features such as anti-slip grips, low kickback, and ergonomic designs not only facilitate ease of use but also keeps you safe while working from the ground. Aside from safety, the second most important consideration when looking for a suitable tree pruner is the weight. Depending on the height of the trees in your backyard, you’ll be holding the unit in your hand to access overhead branches and limbs most of the time. Using a lightweight and compact tree pruner minimizes the chances suffering from hand fatigue, straining your neck and shoulders, throwing your back out in addition to preventing blisters from growing all over your hand. Gas-powered models generally tend to be heavier than their electric and battery-powered counterparts. And just because you want a lightweight model doesn’t mean you should compromise on quality. Closely tied to the weight factor are balance and control. The greater the control and balance the better you’ll be at finessing the cutting head, which in turn will ensure your safety. When a tree pruner is properly balanced, you’ll have the easiest time manoeuvring it on tall trees to reach branches and twigs in hard-to-reach spots. You’ll also be able to use it for much longer before you start to get fatigue. The vast majority of tree pruners have their engines or motors centrally placed with oval-shaped poles to make sure the units are balanced and easy to control. As such, you’ll be using way less energy and taking less time to get the job compared to using the unbalanced off-brands. Another significant consideration when buying a tree pruner is the amount of power the motor/engine is capable of generating, as this will be determinant of its cutting capacity. Gas-powered tree pruners are the most powerful of the lot, even though operating them will inevitably involve mixing fuels and oils, which can be a little messy. Nevertheless, they’re your best bet for effortlessly and quickly handling large diameter branches and limbs. Battery-powered models are less powerful but have the advantage of unrestricted mobility as you don’t have to deal with power cords and cables as is the case with electric models. Some tree pruners have designs that allow you to attach additional accessories that expand entirely their use. This is especially true for gas-powered models. Some of the compatible attachments are edgers, blowers, hedge trimmers, or even calculators. The attachments don’t usually come with the package; you’re going to have to buy your own. The attachments make it relatively easy to access high-reach spots around the garden. A blower will make cleaning the gutters easy and quick while a hedge trimmer will leave the top of tall bushes well-trimmed. Q: Are there any safety tips, measures or things to do before starting my tree pruner? A: There is a short checklist of precautionary measures you need to keep in mind before starting your tree pruner. To begin with, ensure you’re donning the right gear. Your clothes, for instance, should fit you tightly but comfortably, and they should be heavy-duty to protect you against any unforeseen dangers. Safety gear in this sense, other than clothes, also includes boots, gloves, a hard hat, and ear plugs in case your unit is noisy. Also, inspect the amount of oil remaining in the reservoir keeping in mind that the levels should at least reach the half-full or half-empty mark, depending on your psychological perspective. Additionally, children and your furry friends should not be within proximity to minimize their exposure to falling branches and limbs. Q: How do I use a tree pruner? A: Using tree pruners is a very straightforward and easy endeavour. But still, some pointers can make your work incredibly easy, ensuring you expend minimal energy and get the job done quickly and efficiently. For one, keep your feet reasonably apart to increase stability and use the left hand for holding the unit and the right one for working the controls. Apply just the right amount of pressure on the pole, letting its weight and gravity to do most of the pressing. Cut at an angle and not directly under the branch you’re cutting, so it doesn’t fall on your head. Keeping these measures in mind will ensure your safety and considerably prolong the lifespan of the tree pruner. Tree pruners offer a multitude of advantages over standalone chainsaws and ladders. Their practicality, contemporary looks, functionality, versatility, and high-performance make them the go-to tools for trimming, cutting and pruning the overgrown and low-hanging branches and limbs on your yard. They are also much safer and cheaper than other conventional alternatives. Our list features only the best the market has to offer. They tick all the right boxes, have been tried and tested and proved to over deliver each time. Plus, they feature high-quality construction and will easily last more than a lifetime if used properly. We hope this list helps you find what you’re looking for.